I always thought summer should be just called “Laundry.” Spring, Laundry, Fall, and Winter. And now I am proposing January be called “Sigh.” I don’t even mean to sound melancholy, much. It’s just such a pause in a way, between the holidays, and anything else of great consideration (other than MLK’s birthday, and Jack’s birthday, and a few other moments of note, some national, some quite domestic). This January finds me testing recipes for the next book at a rapid clip. A year sounds like a long time to write a book, and perhaps some years it perhaps could feel ample, but not this year. My early April deadline is coming at me like a line backer on steroids. (I just Googled “what kind of steroids do line backers take?” in the attempt to be more specific, but then started getting very freaked out). What’s my point here? I don’t know. All I know is that when I do come up for air, despite what I do for a living, I can find myself staring at a package of chicken breasts while a deafening silence echoes throughout my brain as easily as the next person. Uhhhhhhhh…….make…….dinner…….uhhhhhhhhh. And this chicken was born of one of those moments. That jar of green peppercorns sitting in the door of the fridge. What promise! What inspiration! And really, they did jump start the figurative gerbil, who got back in the wheel, and helped me make dinner. And in the end a few simple pantry ingredients turned everyday boneless chicken breasts into a meal I would be pleased to serve company. This vibrant sauce is wonderful over piles of fluffy jasmine rice. The end. That was longer than I thought it would be. Season the chicken lightly with salt and pepper. Heat a large skillet over medium-high heat, add the olive oil, and sear the chicken for 2 minutes on each side until golden brown, but not cooked throughout. You will probably need to do this in two batches to avoid crowding the chicken and allow it to brown nicely. Set the chicken aside on a plate. Return the pan to the heat (don’t clean it! ), and add the garlic. Stir for one minute until golden and aromatic, then add the white wine and stir and scrape the bottom to loosen up any browned bits stuck to the pan (which will add flavor to the sauce). Add the broth, Dijon mustard, and peppercorns and stir until well blended. Allow the mixture to come to a simmer, add the chicken and any accumulated juices back into the pan, and simmer for 3 to 4 minutes until the sauce has reduced slightly and the chicken is cooked throughout. Place the rice on a serving platter or individual plates and place the chicken on top. 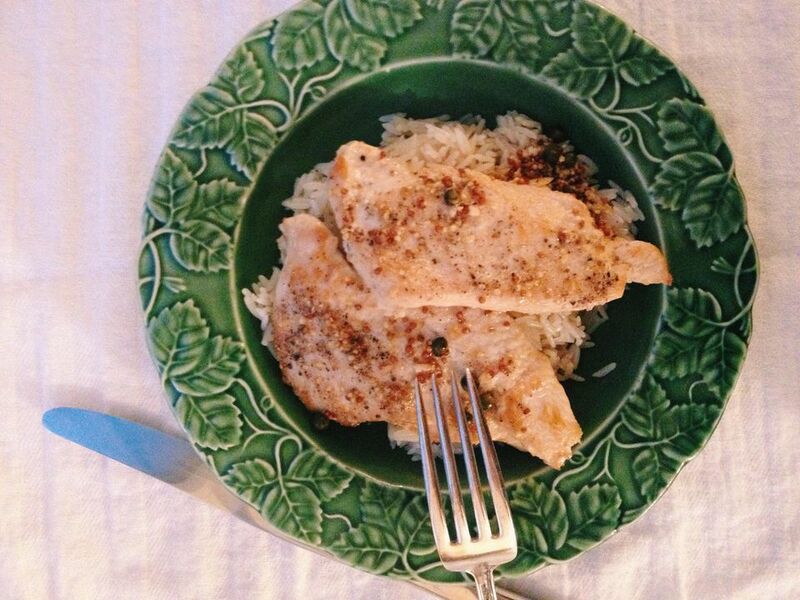 Pour the sauce over the chicken and rice and serve hot.